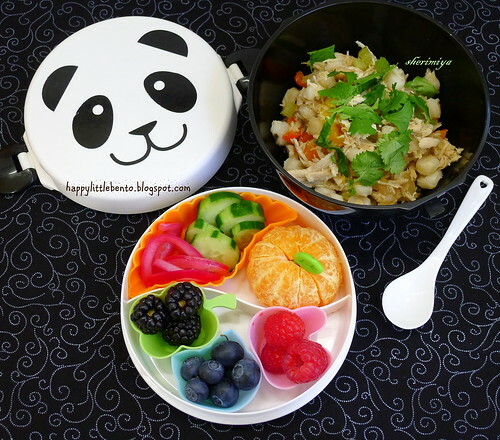 Chicken Hominy Bowl Bento, a photo by sherimiya ♥ on Flickr. This one is called Chicken and Hominy Chili, but it's not really a chili; to me it's more like chicken soup. However, for this bento I served it over rice and omitted most of the liquid. So I guess it turned out to be more like chili after all. The flavor is a bit mild for my taste, but the kids seemed to like it, and it's a nice change from the tomato-based chili that we usually make. Along with the cilantro and onion-topped chili bowl, this bento contains: satsuma mandarin, a variety of berries, and home-pickled cucumbers and red onions. Both kids are huge fans of the pickled veggies. I have still to try pickling carrots, cauliflower and peppers. Place chicken in slow cooker and season with salt, cumin, black pepper and oregano. Scatter onion, garlic, celery, jalapeno and green pepper over chicken. Stir in hominy and cornmeal. Add more spices to taste if needed. Stir in cilantro, top with tortilla chips, sour cream and more chopped cilantro to serve. I love all of the different colors in the fruit and pickle tray. It looks like spring!!! It is almost spring. Yay! What a pretty assortment! So many fresh colours and flavours!